More protests took place in Philadelphia following the arrest of two black men inside a Center City Starbucks. 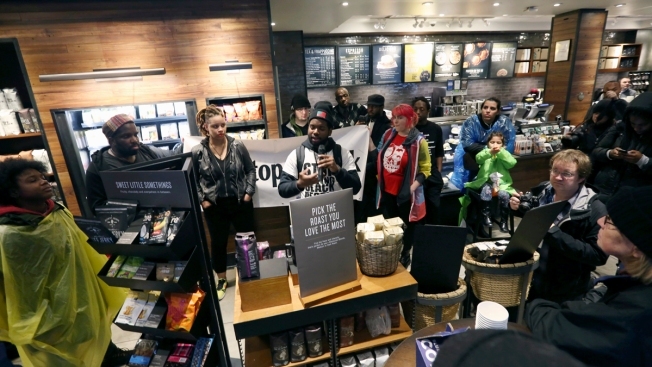 Starbucks’ leadership team embarked on an apology tour through Philadelphia Monday as they attempted to assuage outrage over the arrest of two black men at the chain’s Rittenhouse Square store last week. Mayor Jim Kenney said Starbucks CEO Kevin Johnson and COO Rosalind Brewer were "contrite" during a 40-minute meeting with city officials in Kenney’s office. "It’s a societal issue. People react different based on the color of someone’s skin and it’s wrong,” Kenney said. "I’m satisfied that they came here and were contrite." Johnson called the meeting, which also involved Philadelphia Police Commissioner Richard Ross and Councilman Kenyatta Johnson, "constructive." He previously pledged that employees will undergo “unconscious bias” training and that the coffee chain would review its policies on when police should be called to a store. "This is just the beginning of a lot of work that we plan to do together and we look forward to a very positive outcome here," Brewer, the COO, said in brief remarks while leaving the meeting. Ten blocks from where the two spoke with city officials, protesters gathered for a third day at the 18th and Spruce street store where the arrest took place. Members of the interfaith group POWER sang “We Shall Not Be Moved” as they entered the store and sat on the floor in front of the coffee bar. The group later left the store and marched to a second Starbucks location at 15th and Latimer streets chanting "no justice, no peace." It was Thursday afternoon when the two men — who have yet to be publicly identified — visited the coffee shop to meet a friend. According to police, one of men asked to use the bathroom and was denied when he refused to make a purchase. The manager then asked the men to leave. When they refused, the manager called 911. Responding officers asked the men to leave several times, Ross said. When they failed to comply, they were arrested for trespassing. Witnesses were bewildered by the exchange. Some recorded video of the arrest on their smartphones. The men’s friend, a white man, arrived as they were being taken into custody and could be heard asking what they had done wrong. The men were eventually released from custody after Starbucks declined to press charges. Johnson privately met with the men Monday, NBC News' Morgan Radford confirmed with a Starbucks spokesperson. The outcome of the meeting wasn't revealed. "We hope to have productive conversations with the hope that something productive for the community can come out of this,” Stewart Cohen, the men’s attorney, told NBC10 ahead of the meeting. The city’s Commission on Human Relations says 13 complaints have been filed against local Starbucks locations in the past 12 months. Roughly a third of those complaints centered around race and skin color while others were related to nationality and religion, according to the commission. The men involved in last Thursday’s incident have not filed a complaint with the office. Rue Landau, the commission’s executive director, said on its face, the situation seems “pretty outrageous.” She said the commission has been charged with leading an investigation into policies and practices at Starbucks. Starbucks has faced a tsunami of criticism for how the situation was handled from people in Philadelphia and around the world. Using the hashtag #StarbucksWhileBlack, some people took to Twitter to skewer the coffee chain. Jack Drummond, the director of Philadelphia’s Office of Black Engagement, said “it’s frustrating to hear about yet another incident where Black men were judged for being Black and present – and as it relates to this incident, being Black, present, and sitting in a coffee shop." One of the most pointed critiques came from Philadelphia’s Police Advisory Commission which is police department’s civilian oversight board. Its executive director, Hans Menos, accused the company of harming an already fragile relationship between police and citizens. "They should consider how police have been used as tools by citizens to perpetuate many social ills - especially racism,” he said as part of a lengthy statement. "They might also consider the current disconnect between the police and communities of color and fraught history surrounding the policing, prosecution and incarceration of black men before they concluded that they needed to involve police to solve this problem."